A long-time initiative of the APA Foundation is the Judith McManus Price Scholarship, a program that funds women and minority students interested in pursuing careers in the public sector. In 2017, six students were awarded McManus Price scholarships through a competitive process. This scholarship is awarded annually to students intending to pursue careers as practicing planners in the public sector, and are able to demonstrate a genuine financial need. Awards will range between $2,000 and $5,000. 2018 Applications will be due June 1, 2018. Check this page in early April for application forms. Winners will be announced in August. Hadley Peterson, a graduate student at Florida State University (FSU), was one of the 2017 McManus Price awardees. Building on her undergraduate studies in Spanish linguistics and international studies, Hadley became interested in planning while working with Habitat for Humanity in Quito, Ecuador. The chance to partner with community members and to learn about the built environment intrigued Hadley. Cities were no longer just streets and houses, but were places to connect with neighbors, to celebrate shared history. It was that combination of people and place that made planning a fit. I’m really interested in facilitation and community engagement. And how planners can ... create a more equitable city and accessible city. And, I guess that’s why I love planning, just working with people to broaden access and connection across people. ... There’s a place for everyone in planning. As president of the FSU Student Planning Organization, Hadley works to awaken others to the possibilities of planning. As APA Ambassadors to FSU undergraduates, high school students — and even elementary school students — Hadley and the Synoptikos team share planning principles and listen to student perspectives. The APA Ambassador Program is a volunteer activity led by members of APA with the goal of increasing awareness and understanding of the power and value that the planning profession brings to communities. Particular emphasis is placed on reaching audiences of diverse racial, ethnic, cultural, and economic backgrounds. Interested in being an APA Ambassador? Contact APA Customer Service for more information. 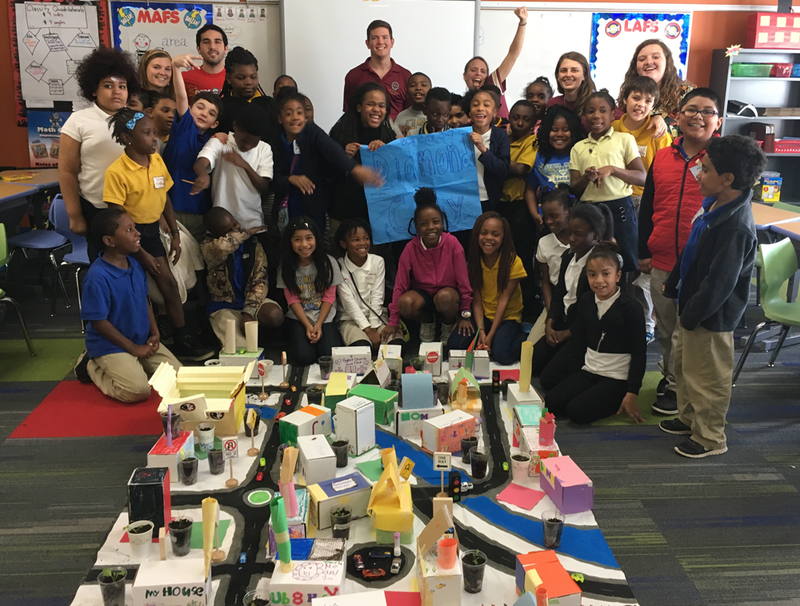 Florida State University students share Box City with elementary school students. Photo by Hadley Peterson. Interested in What APA Has to Offer Students? Opportunities to connect with peers and mentors, attend resume clinics, and participate in mock interviews are part of the 2018 National Planning Conference: planning.org/conference/careerzone/#students. Interested in Supporting Students Like Hadley? Top image: Florida State University planning students at an APA Florida Chapter Conference. Photo by Hadley Peterson.